The 2004 National Association of Geoscience Teachers Southwest Section sponsored a field conference on the weekend of April 23-24. 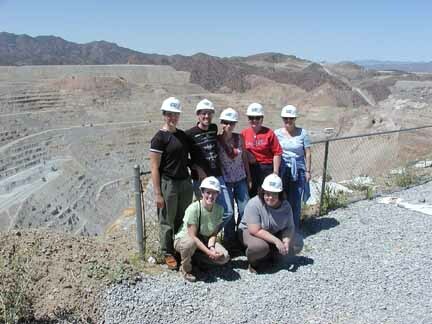 Section President Kaatje Kraft and Vice President Merry Nowicki arranged a field trip to Bagdad (no "h") Arizona to visit the Phelps Dodge copper mine. Bagdad is located in rural desert highland scrub country about 150 km north-west of Phoenix. A center of mining for the past century, this 2 km wide, 200 m deep pit has an estimated 30 years of production left. The mineral ore is of hydrothermal origin in granitic basement rocks. The major products at Bagdad are copper and molybdenum. In addition to active open pit mining, the Bagdad operation has pioneered the solution extraction/electrowinning (SX/EW)) process to reclaim metals from old tailings. Miners at Bagdad also continue to develop other efficient and environmentally sensitive methods to produce copper and valuable byproducts. Dr. Steven Semken of Arizona State University (PhD M.I.T.) presents his research on a native American approach to geological education. "The Navajo people are intimately tied to their environment. 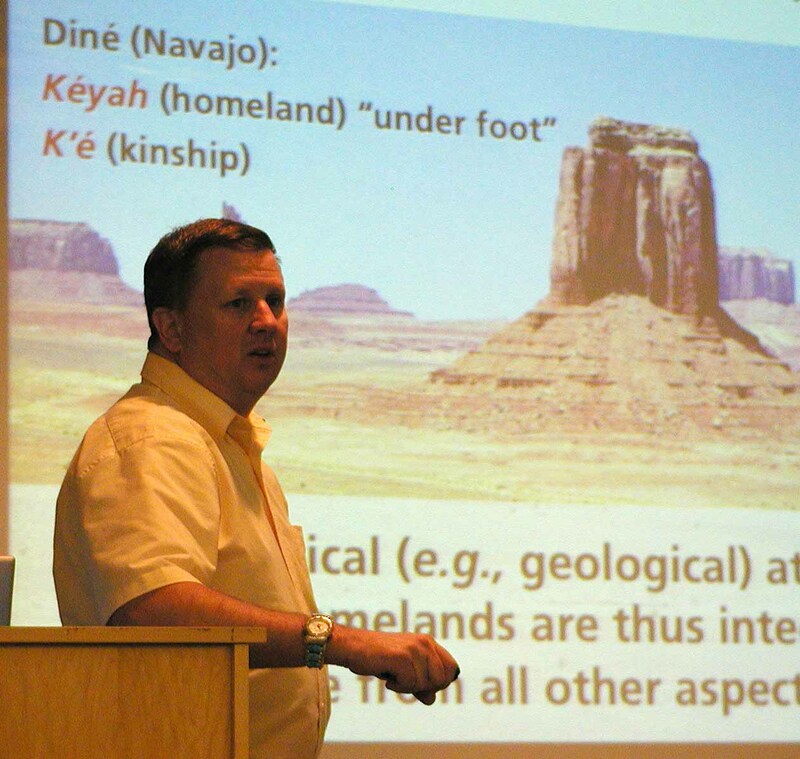 If we approach geology through a "sense of place" the study of Earth processes can become a part of Native American culture." 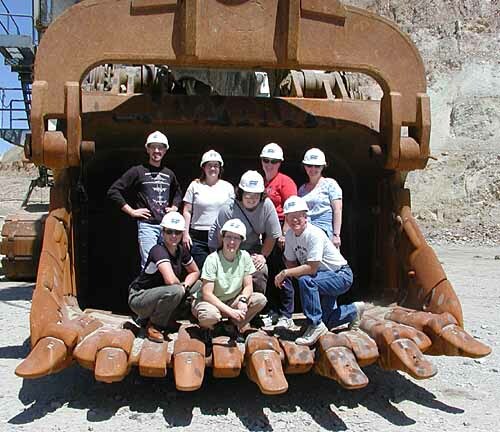 Section President Kaatje Kraft of Mesa Community College (in green), and other NAGT participants field trip pose inside the bucket of a Bagdad earth moving machine. 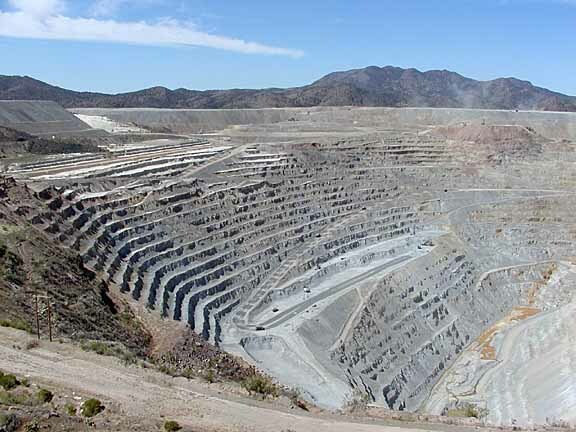 The Bagdad open pit copper mine. The trucks being loaded below hold about 300 tons of rock each, and have tires about 4 m (12 feet) in diameter. The ore is less than 1% copper. NAGT group at the overlook and computerized control center of the Phelps Dodge Bagdad mine.